Frankfort artist Ann Loveless made history last weekend at ArtPrize Seven. She’s the first artist to win the public vote twice in the annual international art competition. Plus she’s part of the first collaboration entry that has ever taken home the Grand Prize. She and her husband, Steve, entered together under the name Loveless PhotoFiber. 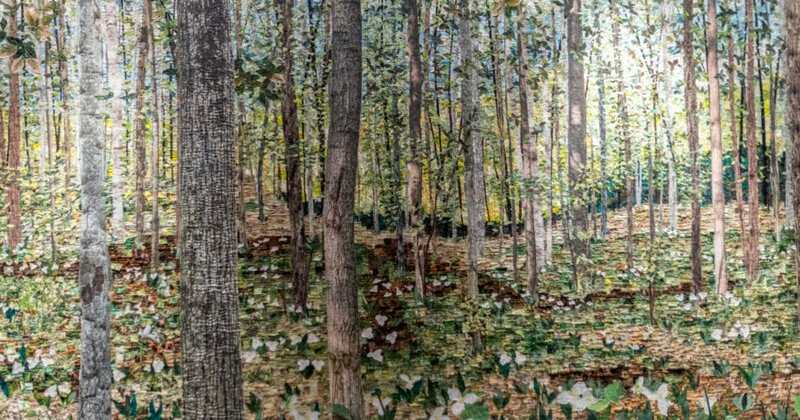 Their winning artwork titled Northwood Awakening is a blend of Steve’s photographic print and Ann’s art quilt. Their 25-foot-long piece on display at the Gerald R. Ford Presidential Museum in Grand Rapids grabbed the attention of visitors with five 5-by-5-foot panels—a size Ann says was helpful in winning the $200,000 Grand Prize public vote. It’s so crowded at ArtPrize that “if it’s not big, you don’t have a lot of people looking at it,” she explains. Half of the winning panoramic Northern Michigan outdoors scene is a photograph taken by Steve in Benzie County. The Dryhill Trails—part of the Arcadia Dunes Nature Preserve protected by The Grand Traverse Regional Land Conservancy—was the ideal location for Steve to capture the essence of Northern Michigan in the spring. “We thought spring is waking after a long winter slumber, and we thought it might resonate with people,” says Ann. Taking inspiration from Steve’s photograph, she finished the work by stitching 37,000 chips of fabric on the remaining half of Northwood Awakening. Ann says the pieces fit together “like a puzzle,” by using 18,000 yards of thread and her sewing machine. Ann took home the ArtPrize Grand Prize in 2013 as well, with her creative cotton piece Sleeping Bear Dune Lakeshore, that was originally inspired by a photograph snapped by Steve. Their gallery in downtown Beulah is filled with photographs and textile pieces from the pair, too. And thanks to the ArtPrize winnings, Benzie County is getting a lot of attention. There’s no doubt that the couple’s 1,100 hours of hard work on Northwood Awakening will continue to positively affect the community’s foot traffic—especially with all their art on display in their downtown Beulah gallery. 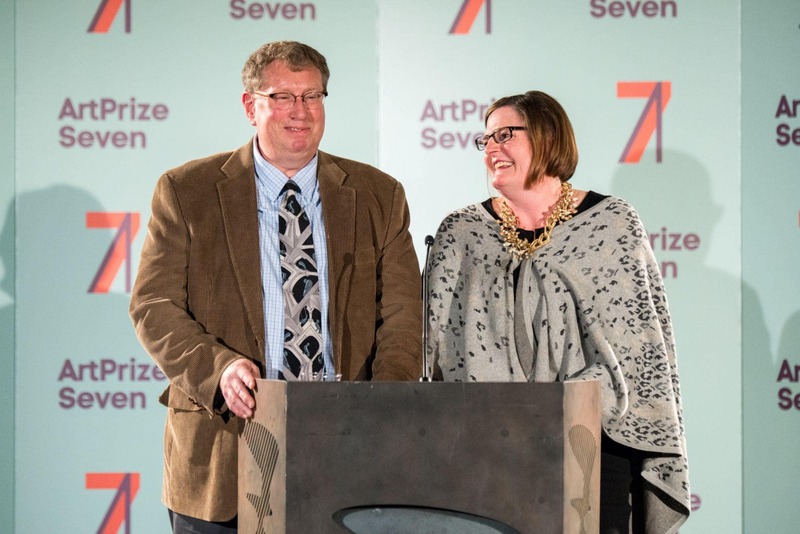 And since their ArtPrize financial winnings are going toward new “His & Hers” studios in the duo’s Frankfort home on Crystal Lake, art fans can’t wait to see what they’ll come up with next in their new creative space with so much Northern Michigan inspiration around them. Were you not able to make it to Grand Rapids for ArtPrize Seven, but still want to see the winning art? Join Ann and Steve for a reception at the Elizabeth Lane Oliver Center for the Arts in Frankfort on Wednesday, October 21, from 5 to 7 p.m.